Above and Beyond Catering is the bartending answer for your private party, wedding, corporate event, or celebration of any kind. Bar catering is also available as a standalone service. Our bar services team is comprised of handpicked professionals with unparalleled experience behind the bar. Above and Beyond Catering holds a Massachusetts state liquor license. We also carry both general and liquor liability insurance, while our bartenders are TIPS Alcohol Training Certified. Not only are our bartenders seasoned and trained professionals who know how to keep beverage lines moving, they are deeply committed to a safe and responsible event for all guests. While planning your food menu, don’t forget you can customize your beverage menu with our bartending professionals! 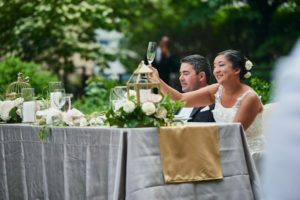 From custom signature cocktails to select wines, your guests will have an exciting beverage experience to match not only their appetizers, main meal and desserts, but the decor and theme, too. From a contemporary martini bar, a tropical drink station, or an elegant champagne reception, we will provide a selection to fit your tastes and theme. Our large inventory allows us to offer the best range of beverages while ensuring you don’t have to worry about overspending or running out of your favorite drinks. Responsibility means more than just providing a good time. At Above and Beyond Catering, we want you to enjoy your event safely and within full compliance of the venue’s insurance requirements. It’s why we’re on the preferred vendor list of so many great Boston locations like the extraordinary 9OFS. Trust our catering and bar professionals when it comes to dealing with alcohol at your next corporate event. With almost two decades of experience, we know how to safely integrate alcohol and food into a memorable experience until the party is over. Intimate dinner party? Backyard graduation party? Social tea with amazing cocktails? Certainly Above and Beyond Catering is known for its amazing food and service. But, do you know we craft our signature cocktails with the same fresh fruits and syrups as our award-winning food? Our custom cocktails are as much a conversation starter as our fun and unique pastries and appetizers!